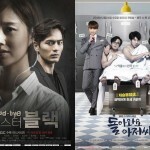 So long to two of the three currently airing Wed-Thurs K-dramas, and especially to the massive Pan-Asia hit Descendants of the Sun for bringing back eight weeks of what felt like the heydays of the ratings past. DotS made drama watching into a collective experience again as viewers tuned in during live television broadcasts and sent the ratings increasing week after week. The final episode 16 aired this Thursday and brought in a new record for the show garnering 38.8% AGB nationwide with a 4% increase from the previous episode.